One of the games of the Epic Indie eShop Sale on the Wii U eShop, Giana Sisters: Twisted Dreams will take up over 4,000 MB on your Wii U hard drive. However, it's also available on PSN (both PS4 and PS3) and Xbox Live Arcade (both Xbox One and Xbox 360). Is it worth even downloading to begin with? Dream a little beautiful but busy dream with me. A bit of a history lesson for you guys and gals here. The original Giana Sisters, which released in 1987, had clear inspiration from Super Mario Bros., even taking the game's first level and basically making a carbon copy of it. 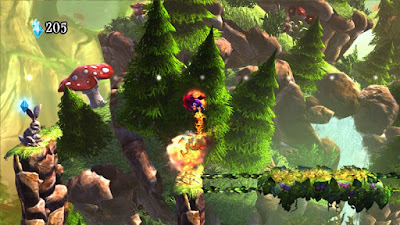 The Amiga game saw a sequel on the Nintendo DS, which also skewed close to Nintendo's smash hit. Now, with a whole new console game with Giana Sisters: Twisted Dreams, the similarities to Super Mario Bros. are pretty much gone. What you're left with is a challenging, sometimes unfairly so, 2D platformer with some genuinely clever ideas. Punk Giana's world is full of whimsy and wonder. 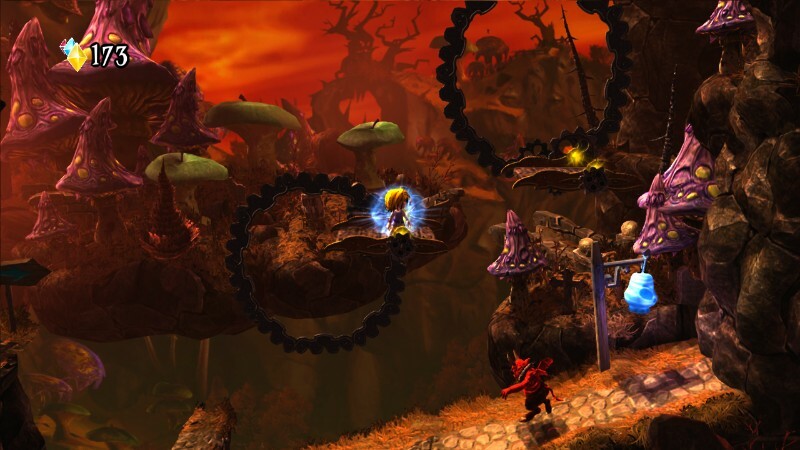 The main gameplay gimmick of Giana Sisters: Twisted Dreams is the "twisting" mechanic. This alters the world and levels between a cute, whimsical, colorful version and a much more apocalyptic-looking setting. It's quite phenomenal how all of the assets alter with such quickness and no slowdown in sight. 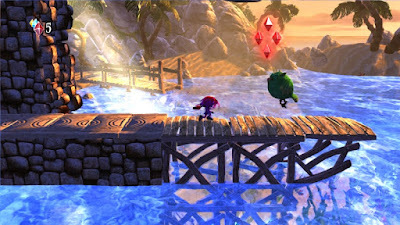 Between the versions, different obstacles become hazardous and not so much hazardous. For instance, thorns in the barren version shrivel up in the whimsical version of a level. Cute Giana's world is dark and foreboding. 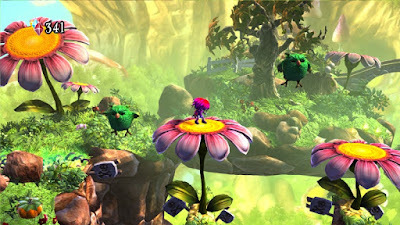 Giana has two forms that are played as in each version of a level. Each possesses a special ability. One can speed into foes, through obstacles, and bounce from wall to wall with her fireball attack. The other can gain extra height and distance with a spinning jump, slowly descending to the ground as she twirls around and around. Using one of these moves, performed with a press of one of two face buttons, automatically twists the world. You can also twist the world with a touch of the shoulder buttons. She's like modern Sonic the Hedgehog with this homing-like attack! The gameplay centers around mastering the ability to switch between both forms with great skill. Some platforms appear in one world while they are removed in another. 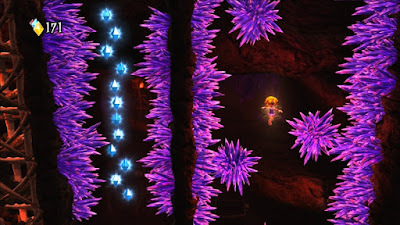 Sometimes you'll have to ride a lift and twist the world with solid timing in order to survive a gauntlet of spikes that do and do not appear in each of Giana's forms' worlds. while spinning the other in the dark world. Scoring in Twisted Dreams' 25+ levels is determined by how many gems you collect-- another part of the game where twisting is necessary, as some gems only appear in one form's world-- and how many times you died before reaching the level's end. And you will die a lot. Most of the time it's due to your own fault and lack of a solid performance. However, sometimes the game just isn't fair, and this mostly the art design to blame. big of an enemy as the actual baddies on screen! You see, Giana Sisters: Twisted Dreams is a gorgeous game, but it seems that it was beauty that killed the beast. That is to say that levels usually have hazards that are just way too hard to see due to how busy the art design actually is, especially prevalent when it comes to spikes. Not knowing if a hazard is actually hazard until it's too late is an all but common occurrence within Twisted Dreams, making a game that is already difficult frustratingly so. The fact that so many visual cues are misleading doesn't help either. Usually in the bright and bouncy Giana form's world, crystals are seen as hazards. 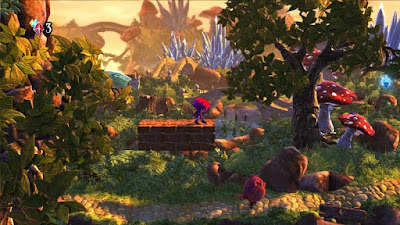 However, the game all too often makes it so sometimes they appear in the background or foreground as environmental ambiance. to death otherwise is certainly questionable as a design choice. It becomes too challenging to tell when a crystal is and is not a hazard. Death comes way too often due to the complexity of the art design of Twisted Dreams, and it only adds to the irritation of playing the game. Sure, there's plenty of checkpoints and infinite number of lives for players to work with, but even the most stubborn player is eventually going to get their feathers ruffled after a while. It's no day at the beach with all the hazards around. Still, even with its lengthy levels and many anger-inducing deaths that Giana Sisters: Twisted Dreams unleashes on anyone who dares try to beat its many challenges, the game is an enjoyable one. Levels consist of clever design and a variety of obstacles from beginning to end. Secret areas are located in some ingenious spots that will force you to comb every inch of a level in order to find them. The controls of both Giana's forms are sublimely tight and responsive-- something great for when the trickier platforming challenges pop their heads into the scene. 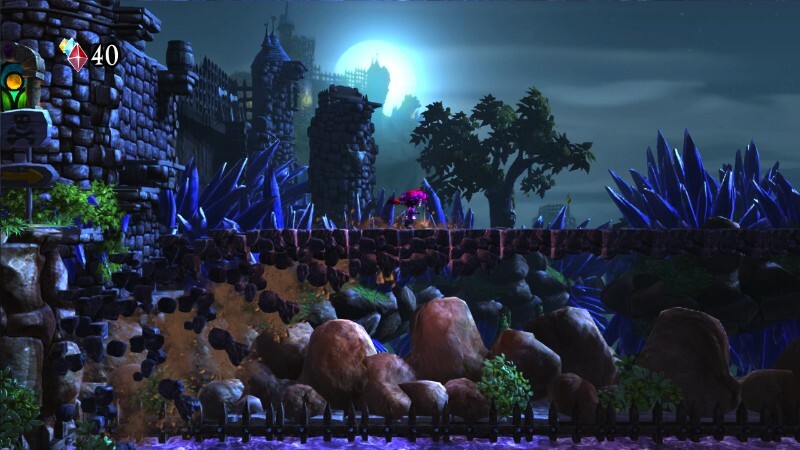 While it's not a fantastic platformer, Giana Sisters: Twisted Dreams offers a beautiful art style-- though its business will result in plenty of unfair deaths, creative gameplay mechanic, and an originality for the Giana Sisters series that hadn't been seen yet until now.